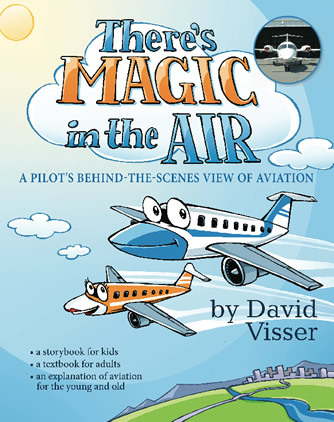 There’s Magic in the Air is a refreshing book about flight, and the magical feelings it invokes in kids and adults alike. Pilot David Visser demystifies the technical aspects of flight, and provides an educational breakdown of turbulence, training, and the complexity of aircraft and the aviation industry. This fascinating book is great for in flight or classroom reading! Kids will enjoy the many illustrations of Johnny and Jamie Jet while adults will gain knowledge and a sense of ease about our aviation system. Send an email to Captain Visser with the name of the person you'd like the book made out to! Captain Visser will also add a note and signature!